Unsurprisingly the Fatbar is shot peened to increase strength and durability. The graphics are chemically applied and oven cured, making it a bit more scratch resistant. At the stem, there are graphics to help you determine fore/aft roll. 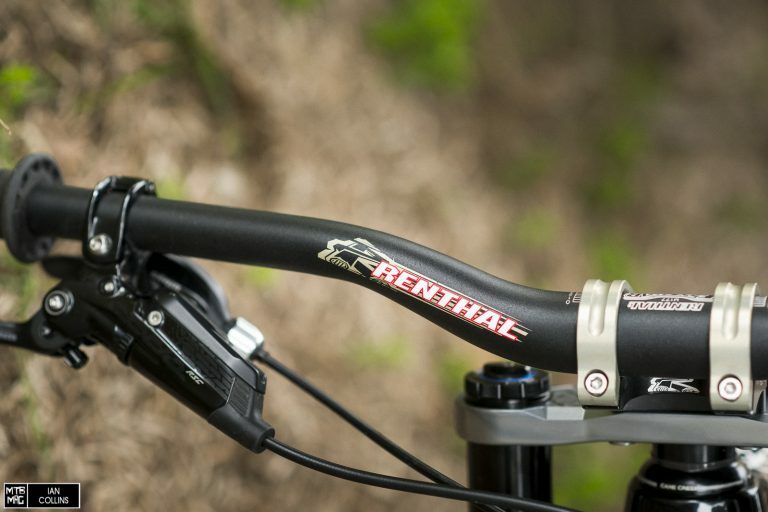 If you have a Renthal stem, the indicators and hash marks line up accordingly. The new Fatbar is made from 7 series aluminum and somehow, despite going from 780mm to 800mm, gaining 20mm in width, it managed to lose ~50 grams. 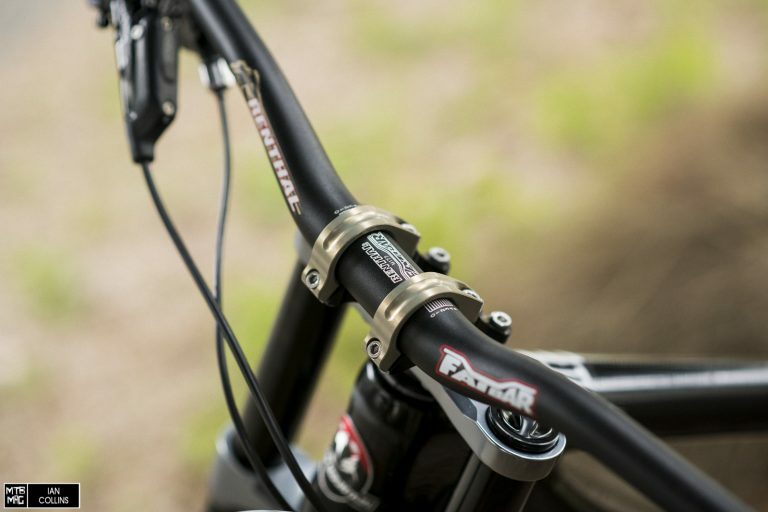 According to Renthal it still retains the same “strength, durability and flex characteristics as the original Fatbar”. As a fairly long limbed rider, I’ve been running 800mm handlebars on my DH bike for some time now. 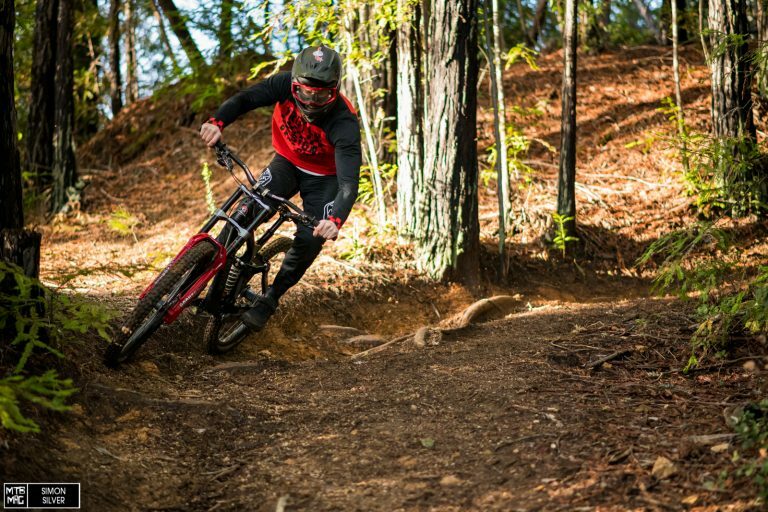 When Renthal launched their 35mm lineup, that was their 800mm debut. 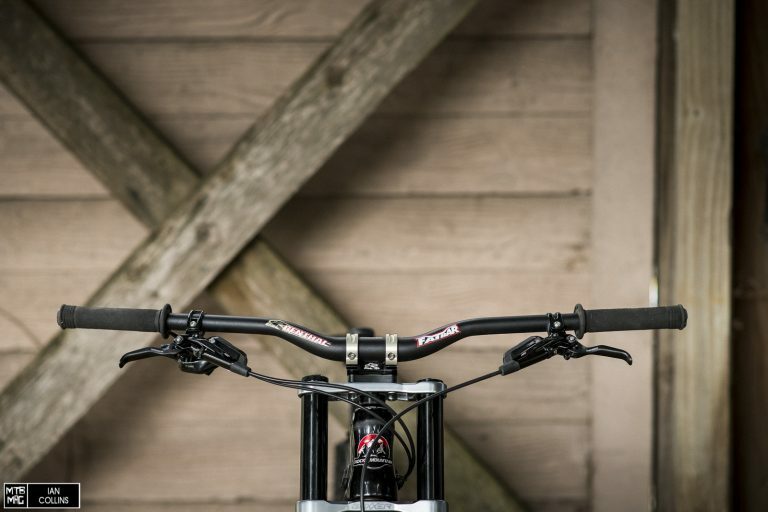 In my opinion, the aluminum version rode a bit on the rough side, and while the carbon fiber version took the edge off more, I’m not a huge fan of carbon bars on DH bikes. If you crash here and there, it’s a dice roll to milk the same handlebar for too long, even if said crashes are somewhat innocuous. So, knowing the flex characteristics of a 31.8mm aluminum bar would likely be more forgiving than its 35mm brother, I looked forward to trying the new full width 31.8 version. I chose a rather middle of the road 30mm rise and left it at full width, but the markings are a nice touch for those who plan to bust out the hack saw and do some trimming. 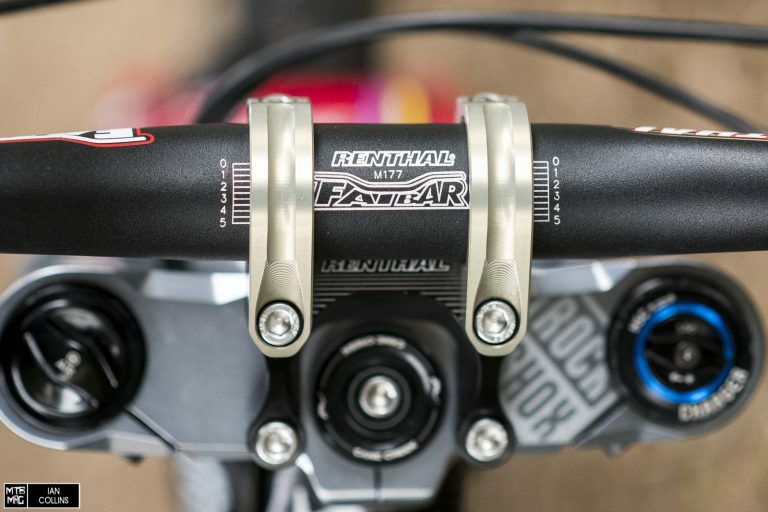 The indicators list from 700-800mm every 5mm per side, although if you plan on hacking a great deal of material off, you may as well consider the narrower Fatbar Lite as it will retain a better ride quality than a drastically shortened full width bar. Obviously the 50 gram weight loss wasn’t anywhere near perceptible, but it all adds up. With that in mind, the new Fatbar has a bit more relief as less material is spread out over a greater area. Perhaps I’m crazy, but I felt like it damped some of the chatter a bit more than the original version. It could also be that the added width put my hands at a point that has more leverage and thus, a touch more flex. As far as the sweep goes, a 7° backsweep /5° upsweep combination feels perfect to me, putting my wrists at a very comfortable angle. That said, like all other contact points, handlebar numbers are totally subjective. Handlebars can only have so many “features”, but on that front Renthal checks all the right boxes. I’ve personally never heard of anyone breaking an aluminum Fatbar, and mine has survived a few decent crashes and cases. Considering it’s not carbon fiber, it still provides a smooth ride quality that balances stiffness, accurate steering and vibration damping nicely. This is likely due to well thought out butting, excellent material choice and smart manufacturing processes. 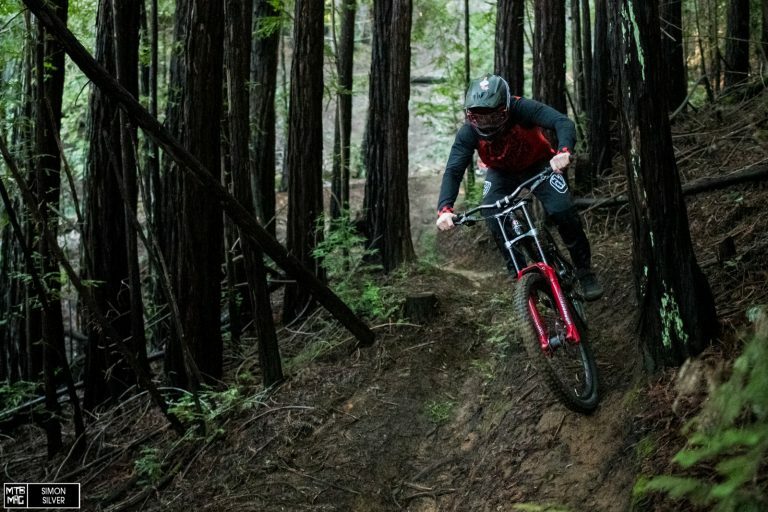 The increased width was definitely due, and if you’re hung up on matching parts, like myself, you might find that the new black colorway meshes better with more bikes. In summary, Renthal made smart updates to a classic, furthering its legacy and confirming its popularity on merit.